Clicking a SAMPLE link below will open a JPG file in a new browser window. Form Wizard – Wizard – ISEF Tool to help a student determine what additional forms are needed above those required for all projects. Dates: Printout should be dated BEFORE experimentation! 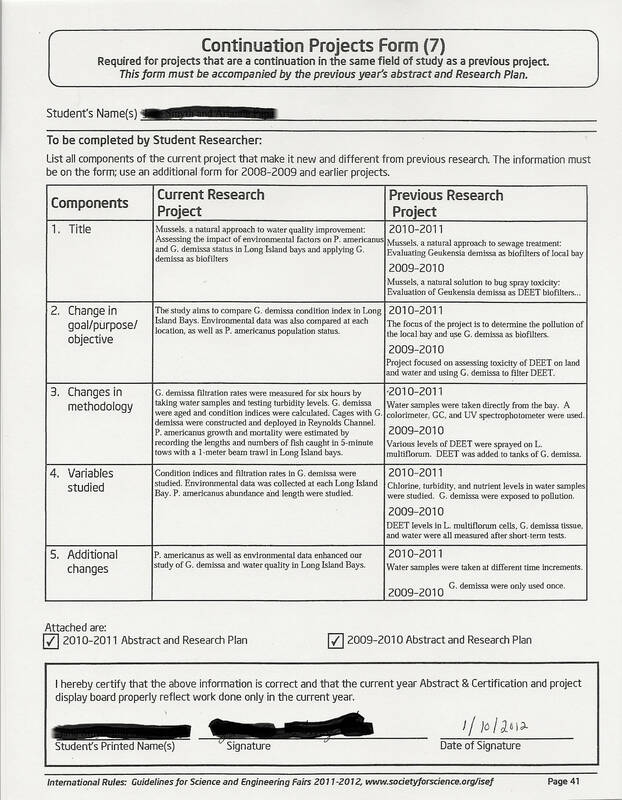 Research Plan/Project Summary – Plan (attached to 1A) – A Research Plan provides information on your research question and procedures to be used to conduct your experimentation. This document is written AFTER your literature review and BEFORE you seek Approvals. The SRC will use this document to assess if the research complies with all ISEF rules and regulations. A change in your Research Plan requires another SRC/IRB review if the research involves human participants, vertebrate animals, PHBAs or hazardous chemicals, activities and devices. All changes must be included in an addendum; if no changes are made, include in an addendum the statement that no changes were made after the original research plan and approvals. Subject-Specific Guidelines applies to projects involving human participants, vertebrate animals, PHBAs or hazardous chemicals, activities and devices., MUST address ALL of the additional required bulleted items; these items should be bulleted within Section-C.
Form 1 – Adult Sponsor Checklist – Used to document that the student and Adult Sponsor discussed the proposed student research project, that a discussion of possible risk occurred, and that the student is aware of what prior SRC/IRB review is required and what forms need to be completed. For #6 be sure to read through this section, check any appropriate boxes, if applicable, AND attach completed additional forms if required. Important Note: The check boxes following Testing student designed invention/prototype apply to HUMANS as well. For RRI projects AND Adult Sponsor is a HS teacher: Ideally, BEFORE experimentation but MAY be done if the teacher does not confer with the student until after experimentation when the student returns to school. Form 1A – Student Checklist – Information form to include contact information (email addresses will be used to contact you about the status of your project), name of project, adult sponsor name and address where research took place. START DATE: when experimentation begins or training on equipment and techniques begin. END DATE: entered by hand once the experimental stage of the research is concluded. START DATE: NOT BEFORE Jan. 1 of the previous calendar year to the fair's date. END DATE: the length of the research must not exceed 12-consecutive months. As long as the one year interval is not surpassed before ISEF, a student may write ONGOING. Form 1B – Approval Form – Signature form to sign acknowledging that the project complies with ALL ISEF rules. Additionally these statements attest that each of these people (or committees) approves or consents to this project. Section 1: Student takes this form home along with research plan for Parents' review. Section 2: SRC/IRB signature required for projects involving human participants, vertebrate animals, and PHBAs; other projects do not need SRC approval.. Box 2a is for the Local SRC/IRB Review BEFORE experimentation and APPROVES the project. Box 2b is for the Local SRC acknowledgement that prior approvals were conducted at a RRI where the research was conducted. ; When the local SRC review occurs, the local SRC must have a signed copy of Form 1C and, if needed, all prior review documents from the RRI such as an IACUC (vertebrate animals), IRB (human subjects) or an IBC (Biosafety). Section 1: BEFORE the start of experiment, but MAY be after SRC/IRB review. Official Abstract – Abstract – A summary of experimentation. This form also serves as a checklist for any additional forms that may be needed. Must NOT include: acknowledgements or mentor work/procedures. 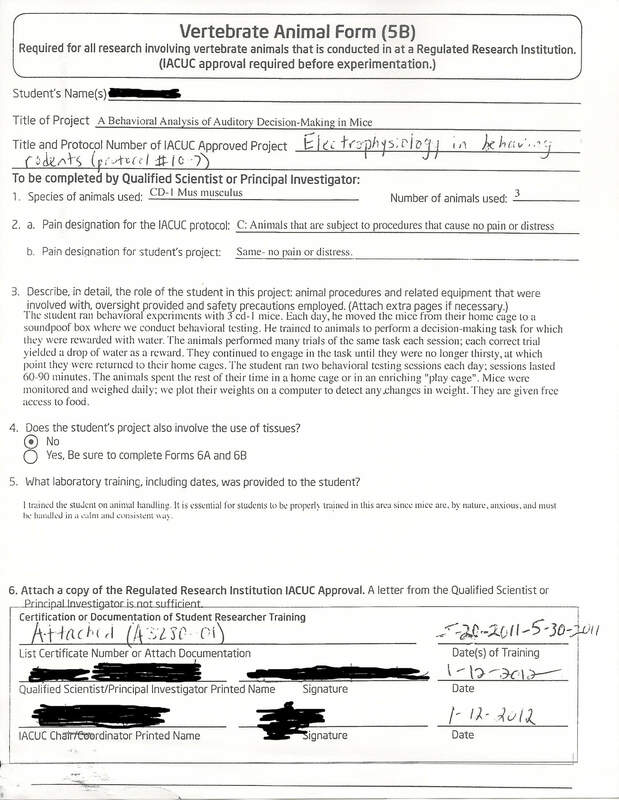 Form 1C – Regulated Research Institutional/Industrial Setting Form – This form, completed by the supervising adult at the Regulated Research Institution (RRI) industrial setting,or any mentor, outside of their schoo/home environmentl, providing some form of assistance to the student; explains what the student researcher actually did. 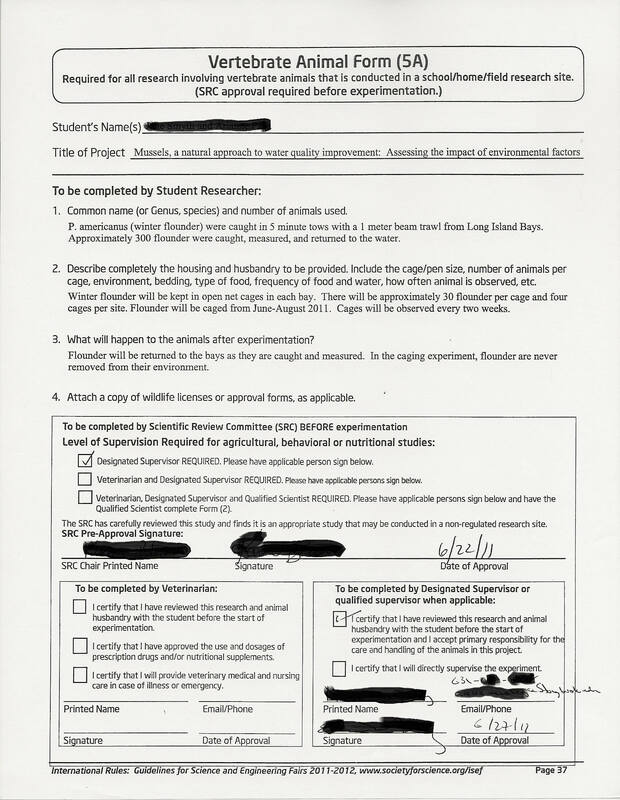 Student enters their name and title of their project prior to giving this to their supervising adult at the place where research was conducted other than home/school/field; the student MUST NOT complete the remainder of the form. The supervising adult’s responses MUST BE ON THIS FORM and not attached. The student MUST submit a copy of this signed document to their high school SRC to assist them in determining if this research complies with ISEF rules and guidelines. Student MUST display a copy of this document at their project on the day of the fair. Dates: Completed AFTER experimentation has concluded. Who Requires? Research projects that were conducted at: a research institution (ex. university lab) or in an industrial setting or received some form of assistance outside of the school/home environment. Form 2 – Qualified Scientist Form – On this page, the scientist explains what will be done to oversee this project. 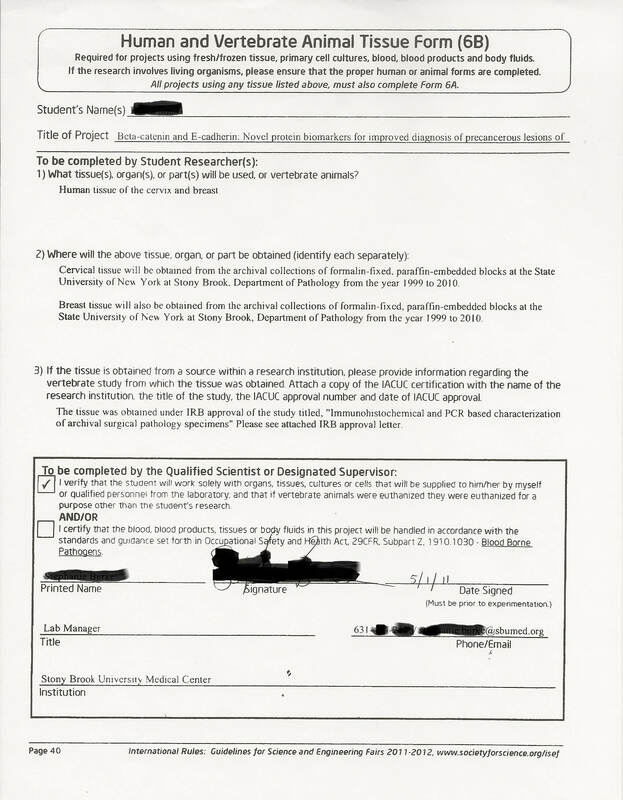 Student enters their name and the title of their project prior to giving this form to the Qualified Scientist (QS); this form must be given to the QS prior to the start date. 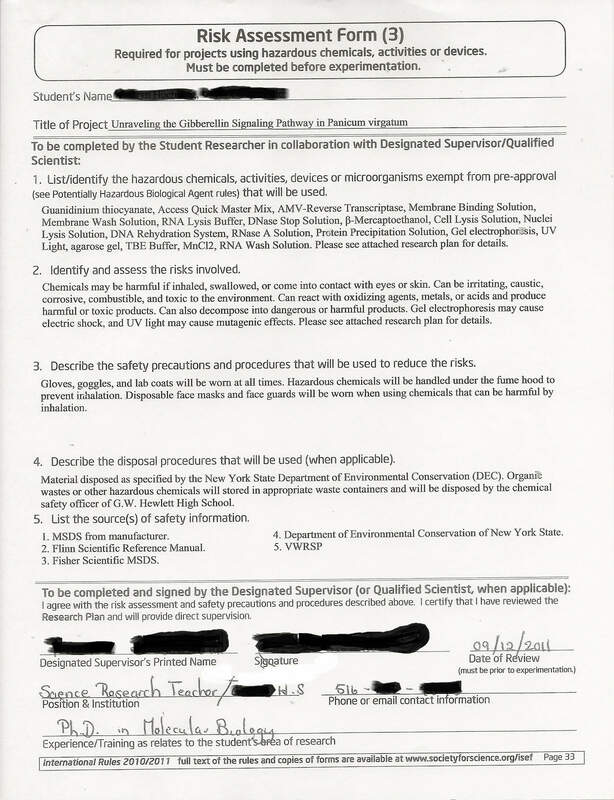 The qualified scientist and, if needed, the designated supervisor*, sign with the date that they approve this project. * If the QS will not directly supervise the student, a designated supervisor must also sign. Form 3 – Risk Assessment Form (Sample) – Important to ensure that the student understands any risks that may be involved with the project and ensures that all safety precautions were taken. Completed by student in collaboration with the designated supervisor/qualified scientist. Additional pages may be attached. Do NOT attach MSDA sheets. Form 4 – Human Participants Form – This page, along with the research plan and consent form sample, is submitted by the student researcher to explain to the IRB how the safety and well being of the test subjects and the confidentiality of results will be ensured. Student completes top section, even if work done at RRI. Institutional Review Board (IRB) reviews the project, checks the risk level (Risk Assessment Guide) and determines if a Qualified Scientist and/or Designated Supervisor and/or written documentation of assent/consent/permission is required. "Benefits should outweigh the risks." LISEF does not allow Expedited Review. Each IRB member signs with the date they approve this project and must state their degree/professional license. Attach all survey instruments, scripts, copy of the consent form (Sample Consent Form) to be used, and letters of permission to use instruments not of their own construction.? For more explanation see Human Participants rules. Dates: All signatures BEFORE any experimentation takes place. Human Informed Consent Form (Sample) – To provide written documentation of assent/consent/permissions and to inform participants as to the purpose of the project, its risks and benefits and to ensure willing participation. The student researcher must complete ALL of the questions; it is unacceptable to say there are no risks or no benefits. The benefits should outweigh the risks. The answers should parallel those provided in the research plan. Disseminate and collect in a manner that protects privacy and confidentiality. Please check that signatures are dated. Please submit one for every participant; we do count them. NEVER submit the originals, only copies. If doing an online study, the first page obtaining assent/consent must contain all elements of this form except the student’s name(s) and must have a button to click or a box to type the assent/consent to enter the study. A copy of this page must be submitted and a printout showing the number of completed surveys. Dates: All signatures must be between START and END dates. Who Signs? Human participants, and parent/guardian if required by the IRB. Who Requires? All Human Participant research where required by the IRB, usually all with a Risk Level of More than Minimal Risk. Form 5A – Vertebrate Animal Form (non-RRI) (Sample) – To describe animal care throughout experimentation and to ensure that all rules and safety precautions are followed. Information regarding the care of the animal is completed by student. LISEF affiliated fair SRC reviews this document BEFORE experimentation and determines the level of supervision required. If required by the LISEF affiliated fair SRC, a veterinarian and/or designated supervisor review and sign this form. Submit a Form 2 (QS) if required by the LISEF affiliated fair. Attach wildlife licenses or approval forms, if applicable. Dates: All licenses and approval forms must be signed and dated BEFORE experimentation. Form 5B – Vertebrate Animal Form (RRI) (follows 5A) (Sample) – To describe animal care throughout experimentation and to ensure that all rules and safety precautions are followed. Student completes Name, Project Title and Title and Protocol Number (obtained from the IACUC Approval document). Information regarding the care of the animal is completed by the Qualified Scientist. Attach a copy of IACUC approval; it cannot be a letter from qualified scientist or principal investigator. Dates: Form must be signed and dated AFTER experimentation. Form 6A – Potentially Hazardous Biological Agents Form (Sample) – To describe hazards, biosafety level and the necessary precautions to implement when working with PHBA. Section 2: Completed by QS. Section 3: Completed by QS or DS. Research site is home, school or field: Check box 1. Check BSL level. Research site RRI: Check either box 2 or 3. Section 3: QS or DS must check BSL level. Section 3: If research conducted at RRI and box 2 checked, attach institutional board approvals (these approvals occur BEFORE experimentation) such as IACUC, IBC, RAC. Section 4: Signed by Local SRC. Form 6B – Human and Vertebrate Animal Tissue Form (Sample) – Identifies the tissue and its source. Student enters name and title. Section 1: Completed by the student BEFORE experimentation. Section 2: Completed by QS or DS. Form 7 – Continuation/Research Progression Projects Form (Sample) – Documentation for a continuation project (project is in a similar area of research as previously done by a student as either an individual or team member) describing how it differs from the previous year(s). Student leader enters their name, and if applicable, the names of teammates. Explain thoroughly the differences between each years' research; must be significantly different than previous studies, such as a new variable introduced. Using same variables, research question and methodology or increasing sample size are UNACCEPTABLE continuations. Attach extra pages if the continuation involves more than 3 years of research. Attach an Abstract and Research Plan for each of the years of previous research. Dates: Signed on the date that student certifies the Abstract and Display Board contain ONLY data and results from current year, usually AFTER abstract complete. If research conducted at an RRI, this form should be signed before the local SRC signs Form 1B, box 2b. Who Requires? Continuation projects. Note, if the student researcher(s) worked in the same lab in a previous year to gain skills/training to conduct this independent research project, it is considered a continuation.